Radio is a rather new technology-- the commercial radio station is even more recent. 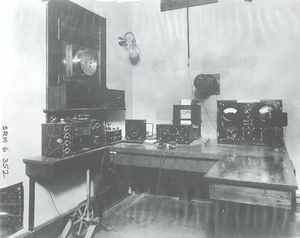 On 24 December 1906, what may have been one of the first wireless transmissions of the human voice occurred at Brant Rock, Massachusetts, a small village less than 30 miles from Boston. The transmission was the brainchild of Reginald A. Fessenden (1866-1932), a Canadian-born American inventor. At the age of 10, Fessenden's uncle was describing a new invention, the telephone. Fessenden asked why it had to use wire. And from that moment on, Fessenden endeavored to invent a way to transmit the human voice without using wires. Brant Rock covers a mere four square miles. Yet it holds the distinction of being the location where one-way voice transmission took place. Fessenden exhibited an early proficiency in math; at the age of 14, he attended Bishop’s College, where he also taught math. He then taught for two years at the Whitney Institute in Bermuda. He was fascinated by the inventions of Thomas Alva Edison and was determined to meet him. Fessenden made his way from Bermuda to New York City and happened upon a job with the Edison Machine Works. Besides working for Edison, he also worked for George Westinghouse, several universities and the United States Weather Bureau. It was while he was at the Bureau that he built a wireless network for communication with weather stations. In 1902, the National Electric Signal Company (NESCO) was formed to promote wireless communication. During his research, Fessenden constructed a transmitting station with a 400-foot antenna at Brant Rock, in anticipation of transmitting voice across the Atlantic. To that point, the only thing that had been transmitted was Morse Code. Fessenden had a contract with the United Fruit Company and installed wireless systems on their ships to assist in the distribution of bananas from Puerto Rico. One of the discoveries that Fessenden made about radio signals is that they travel better in cold and dark weather, rather than light and warm. He made this discovery in January 1906 when sending Morse code to Scotland from Brant Rock. On 24 December 1906, Fessenden, his wife Helen, secretary Miss Bent, and crew assembled at the Brant Rock station, and at 9:00 p.m., after signaling ships at sea to await a transmission, he began the transmission of his voice. This broadcast began with Fessenden playing “O, Holy Night” on the violin. Mrs. Fessenden and Miss Bent experienced stage fright and did not read the Bible passages, as promised. Instead, Fessenden did all of the talking, and the transmission also included music and the reading of a poem. He ended wishing his listeners a Merry Christmas and asking those stations who heard it to write him. The broadcast was heard as far away as Norfolk, Virginia, a distance of more than 450 miles. This same broadcast was replicated on New Year’s Eve. Fessenden would go on to earne more than 500 patents during his lifetime, including patents for a high-frequency alternator, radio telephone, a sonic depth finder and submarine signaling devices. He eventually retired to Bermuda and began studying mysticism. 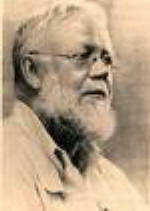 He passed away on 22 July 1932 at the age of 65. 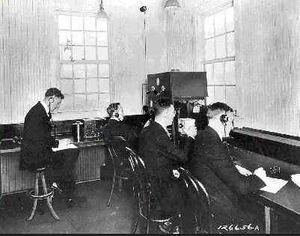 In 1920, one of the first commercial radio stations, KDKA, was established. Their first broadcast lasted 18 hours. The audience heard election returns and music and the original broadcast was said to be heard as far away as Canada. This is an IEEE Milestone in Electrical Engineering and Computing. A number of other IEEE Milestones are also dedicated to radio. Many radio stations today offer streaming audio of their broadcast. It’s free and delivered via the radio station’s Web site. Satellite radio is the new radio. For an annual subscriber fee, usually around $150, and a special radio to purchase (beginning at $50), the listener now has access to digital quality sound. Many of the channels are commercial-free, and the listener has access to over 170 channels of music, sports and news.